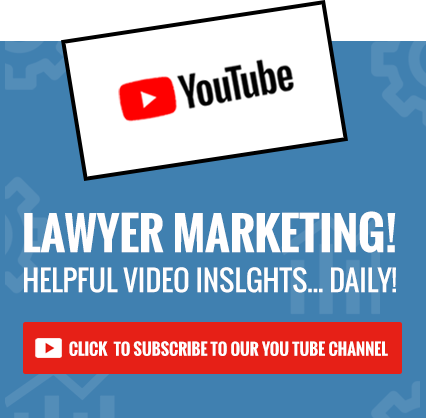 For over 10 years, my job has been to show lawyers how to effectively market their firms so that they can generate leads, sign clients and increase revenues. 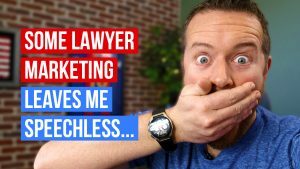 I was the National Sales Director for one the largest Internet marketing companies for lawyers and I currently own one of the best internet marketing companies for lawyers. In these positions, I have had the opportunity to observe the marketing practices of thousands of law firms. By and large, lawyers are very good at practicing law. 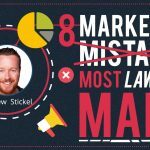 Most lawyers aren’t very good when it comes to marketing. I see the same mistakes repeated by law firm after law firm. Like everything, the first step is admitting you have a problem. 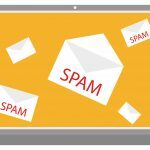 These easily correctable mistakes could be costing you dozens of warm leads and tens or even hundreds of thousands of dollars a year in lost revenue. Currently, that money is going to your competitors who’ve stopped losing leads and revenue when they stopped making some of the marketing mistakes I’m going to talk about here. 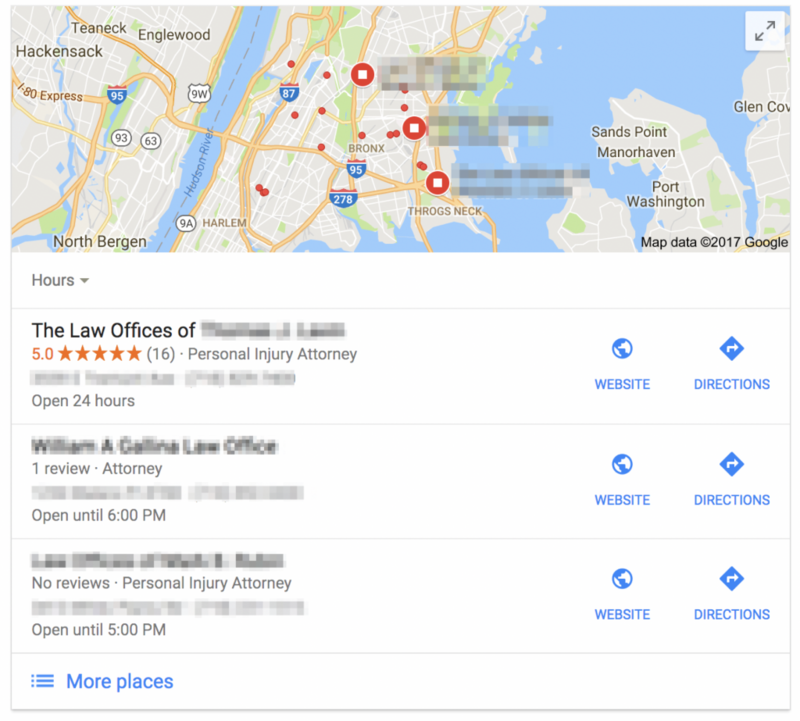 Your firm probably gets some clients through referral but, if you’re like most law firms, the lion’s share of your business comes from marketing. When one of those leads decides to call your office for help, you need to be ready. That’s because when the average person needs a lawyer, they need a lawyer now. Maybe they’ve been in a car accident. The point is, they’re in trouble (or think they are), they want help and they aren’t willing to wait. 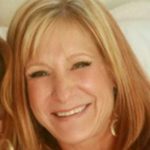 Put yourself in the shoes of the potential client: they are being charged with a serious felony, or the maybe their loved one was killed in a car accident. Do you think they are going to leave you a message and sit around waiting for you to call them back? If you were in their position, would you? The answer is simple – Hell, no! They’re going to hang up the phone (in the middle of your outgoing message) and keep dialing until they talk to an attorney (your competitor). That’s why how you deal with the initial phone call from a potential client is critically important. 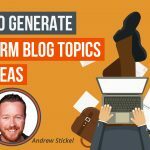 It’s your one chance to convert that lead into revenue. If you screw up this initial contact, you don’t get a second chance – the lead is gone. All you are doing is passing the opportunity to convert that lead on to your competition. If your competition has a better conversion strategy in place, they get the client, the revenue and the advantage over your firm. Unless you are very rare, all your incoming leads are going to be initially fielded by either a receptionist, an answering service, or a voicemail system. How you have these three “point” positions set up will determine whether the potential client on the other end of the phone signs with your firm or your competition. During regular business hours, a receptionist is likely the first representative of your firm that a potential client will speak to. Because of this, it is critical that your receptionist knows how to effectively deal with a warm lead. If the potential client asks to speak with you and the receptionist tells them that you’re not available and then offers them your voice mail, he or she may as well have hung up on the lead. Over 80% of the time, the client is gone and moved on to the next firm. In instances where you or another attorney in your firm are not available to take a potential client call, your receptionist must communicate to the potential client that they understand the urgency of the situation. The receptionist must get the potential clients’ contact information prior to letting them know you are unavailable. Then and only then can they tell the lead that the attorney is unavailable, but they are getting ahold of you, pronto. If no lawyers are available to answer the lead, the receptionist should tell the potential client that a lawyer will call them back quickly and by a specific time, after collecting their contact information. Specifying a time will make the lead feel more confident that their call will be returned, rather than leaving it open ended. There will be instances when you cannot call them back by a certain time – I totally get that – however, it is better to beg for forgiveness later than to lose the lead altogether. Under no circumstances should the potential client be transferred to voice mail. How much do you hate when you call customer service and get a “press 1 for this” and “press two for that” menu instead of just being able to talk to someone? Guess what? Your potential clients hate it too. Get rid of it and just have someone answer the phone. What’s worse is that often these menus aren’t even configured properly, so they are just a jumbled, confusing mess. No one, least of all a potential client, wants to play voice mail roulette. Today, people are getting more and more accustomed to having their needs for information, service and goods being immediately satisfied. On the Internet, every time you make someone click a link, you lose 50% of your audience. That rule holds true in real-life. People want instant gratification and they have short attention spans. The more choices that a potential client faces when dealing with your voice mail system, the more likely it is that they will bail without leaving a message and move on to the next law firm. We have access to the call logs of our clients, so we see that often, calls come in after hours. 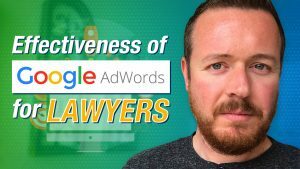 It never ceases to amaze me that lawyers will spend thousands of dollars every month paying Internet marketing companies and bidding on Google AdWords, but balk at $100 per month to ensure that when a lead does come in, they have someone there to field the phone call. A potential client contacting your firm after-hours wants a live body, not a machine. With an answering service, the potential client gets to talk to a real live person who can take down their details, transfer the caller to you in real time or tell them that a lawyer will be contacting them as quickly as possible. Often, this will pause the potential client’s “hunt” for an attorney long enough for you to call them back and hopefully retain a client. However, an answering service is only as good as the way they handle your after-hours calls. The answering service must play into the potential client’s need for immediate action and satisfaction. An indifferent or disinterested voice on the other end of line or taking too long to answer the call will only serve to drive the lead into the arms of your competition. That’s why any potential answering service you’re thinking of using needs to be thoroughly vetted before you hire them. Ask your colleagues about the answering services they use. Be sure that the company you select can transfer the caller directly to you or your office. If you’re stuck, get in touch with us and we can recommend a good service. Then give any answering service that’s been recommended a call so that you get a first-hand feel of how they treat incoming callers. After you hire a service, it is important to do some “secret shopping” with them. Call your firm after-hours to see what that experience is like. If there’s a problem with how they are dealing with your after-hours leads, address that problem immediately or find another service. In the end, a good answering service is a smart investment that only costs a fraction of what you likely spend on marketing. It makes no sense to be paying up to thousands of dollars for leads and then have the leads lost because there was no one there to field the call. I’d like to preface this section by stating that potential leads should never, under and circumstance, hear your voicemail. When someone is not in your office to take leads, a great answering service should be used. That being said, even if you use an answering service, there are times when a technical glitch will occur, or the call center is at full capacity so voicemail is necessary. Remember, leads can come into your firm at any time, day or night. This means that a potential client with a case that might be worth millions of dollars could contact your office at a time when no one is there to answer the phone. If that call goes to voice mail, what’s the experience going to be like for that potential client? How often do YOU leave a voice mail when shopping for a service? If a caller somehow ends up on your voicemail, the outgoing message will be your only chance to capture the lead. If you have a generic voice mail message along the lines of “Hi. You’ve reached the Law Office of (fill in the blank). Please leave a message and someone will get back to you as soon as possible,” you can kiss the lead goodbye. Most potential clients want to believe their lawyer works full time. If your septic system backed up into your house, would you leave a voice message for a plumber you found online that you’ve never met, and then just wait for him to get back to you? Remember, everyone wants instant gratification. It is essential that the lead feels they will receive a response quickly, otherwise they will move on. Now, you and I both know you won’t be able to return every call within 15 minutes, every single time. However, this will increase the leads that leave a voice message. If you can return the call within 15 minutes, great. If not, you call and apologize profusely prior to discussing the case with the person whom you wouldn’t be talking to in the first place had your promise of a promptly returned phone call not enticed them to leave a message. But having reviews on your website just isn’t convincing enough. And guess what: you’re not special – it’s just as hard for your competition. More importantly, online reviews are essential to the efficient conversion of leads. 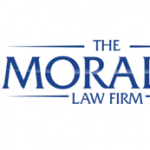 Your firm is one of many similar law firms in your area that focuses on a certain area of law. To a potential client, you are one firm on a list of dozens. They have no idea who you are or they wouldn’t be searching on Google. 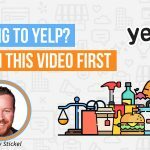 This means that the choice between your firm and your competition often comes down to online reviews, also known as social proof. If a potential lead sees that other people had a positive experience with you, they believe they too will have a positive experience. Think about when you shop for products on Amazon. Do you look at the reviews? Further than the reviews, do you also look at the quantity of reviews? The products are equal in price, appearance and function. One is rated 5 stars and the other 4.6, however, the one with 4.6 stars has more than 900 reviews, while the 5-star product only has two reviews. Now, pretend you are a potential client that was just in a car accident, or whose loved one was arrested on serious felony charges and is currently sitting in jail. Who would you call from the list below? Fortunately, we created a guide to obtaining reviews from your clients. Everyone knows that no one is perfect, and people make mistakes. Any product or service, no matter how good, is susceptible to negative reviews from dissatisfied customers. Plain and simple, you can’t please everyone all the time. However, when you do receive a negative review, it is critical that you deal with it in a professional manner. Don’t get into a public mudslinging competition, and don’t ignore the review. Respond to the reviewer in an even tone apologizing for the misunderstanding and asking them to contact you at your office to discuss the matter. 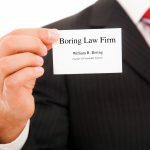 A sample response to a negative review can be found in our article Law Firm Reviews – A Guide to Obtaining Five Star Reviews For Your Law Firm. 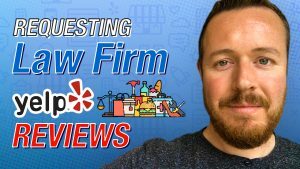 Keep in mind, this response is not for the person that left the negative review – it is for the thousands of people that will see the negative review while researching your firm. It demonstrates to the public that you take the satisfaction of your clients seriously. Your profession is the practice of law. Your business is to generate revenue for your firm. If you are to grow your business, you must learn to sell yourself and your services. This is not a negotiable or debatable point. A successful lawyer is not only a successful practitioner, he or she is also a successful salesperson of those skills. Of course they want information and advice – that’s why they’re contacting a lawyer! When you convince them that they can’t afford to not hire you, they will be more than willing to find the money to pay you for your services. Don’t ever believe a potential client when they tell you they don’t have the money. You have to KNOW anyone can find money if they want something badly enough. There’s money stashed away for a vacation or a special purchase. There’s money that’s being used for entertainment. There’s money that can be borrowed from relatives. There’s even money available from pre-approved credit card offers that they haven’t taken advantage of yet. The problem is that you BELIEVE them. 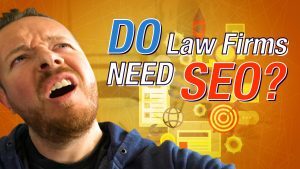 Who calls a lawyer’s office and really expects free services? At some point, most people will find the money to hire a lawyer before they will allow themselves to suffer. It’s your job to reprioritize your position on that list by explaining to them how they could suffer if they don’t retain counsel, so that you come before everything else. Every call that your firm gets from someone needing advice from a lawyer is potential revenue. 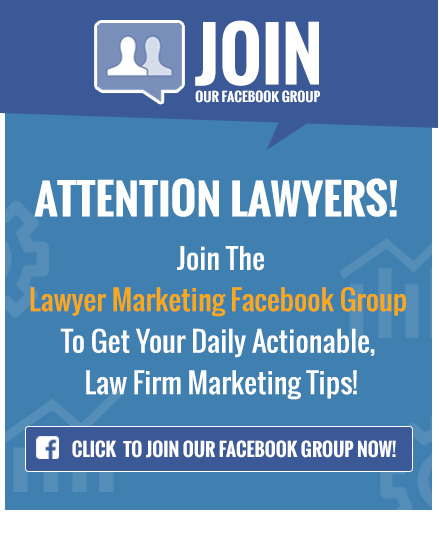 When you are on one of these calls you are not a lawyer, you are a lawyer who is selling your professional services. That’s why in all communications with potential clients you must use the Rule of ABC – Always Be Closing. Remember, the average person has a fear of lawyers and the legal system. For many of them there is a natural aversion and distrust of the whole process. That’s why you need to listen to what to they are saying. This is not just another DUI, drug arrest or car accident. Explain how you can fix the problem. Explain how their life will improve once the problem is fixed. Explain how their life will get worse until the problem is addressed. Become an essential part of the solution to the problem that made them contact you in the first place. Take a sales course if you have to, but close the sale.